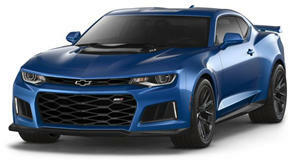 It's available at dealerships, which means you can now walk into a Chevy dealership and order a 1,000 horsepower Camaro. It’s a bit hard to tell if John Hennessey is trying to make a play on the Stig by dressing the AC/DC-listening bad boy in this promotional video similarly to the faceless Top Gear star, but as soon as he, she, or it presses the starter button, it’s instantly apparent that there’s nothing funny about what's going on under the hood. Instead of the loud and bass-heavy burble of a good old American V8, we hear a roar of thousands of explosions trying to rattle the modified engine block apart.